One of the most popular corners of car culture right now is overlanding, a word for vehicle-dependent adventuring or what haters might call car camping with more Instagram. There are posers out there, sure, but this scene is actually producing some very cool innovations in car customization. Last weekend I drove my Pan-Am Safari Scout, the ultimate overland posermobile and a tribute to a fictional event from my imagination, to a meetup of folks who are all about dialing in their vehicles for safaris and such. This was the Southern California Adventure Expo & Vehicle Show, hosted by an outfit called Super Fun Outdoors Adventure. I spent most of a Saturday there, and the first thing I noticed was that there were more couples (and dogs) than I’d seen at any other casual weekend car meet up before. Overlanding has the benefit being about more than just driving, and I think this inclusionary nature is a big part of its rising popularity. The fact that it has a lot of mass appeal on social media doesn’t hurt, either. I chuckled. This is a comical quantity of roof lights, too. People have been putting big, beefy front bumpers on trucks forever. And the same goes for skid plates to armor undercarriages. But the rear quarter panel, and extremely vulnerable place to an off-road vehicle, often goes unprotected. I really like this wraparound rear bumper setup made by the owner of this Land Rover Discovery. Granted, he cut a huge slice out of his quarter panel in order to fit this piece of armor to protect it, but I think it looks pretty sweet and the owner claimed it’s functional enough to take the weight of the whole truck leaning up against it on a rock. Years ago, Jonathan Ward of Icon 4x4 showed me some amazingly cool clear tinted window visors he was putting on a $200,000 Toyota FJ build. “From a LearJet,” he explained. I love them so much I started searching for a set for one of my own vehicles as soon as I got home. I gave up almost immediately after realizing what LearJet parts cost. Apparently I wasn’t the only person who wanted to port this idea to cars though; the owner of this Jeep Wrangler JK told me the visors were just off-the-shelf parts from Teraflex. I looked them up and prices are indeed a lot more reasonable than anything from the aviation industry. The owner of what appeared to be a converted Ford ambulance was very dismissive of his tire table. He said something to the effect of “just made that with some junk that was laying around the garage,” but admitted it had become extremely useful. And yeah, totally! What a great way to get some free flat surface for food prepping, which can be hard to come by when you’re camp cooking for a group. Speaking of finding room for more flat services, I love the idea of adding a drop-down table to a swing-out tire carrier like this. It seems a little redundant on a pickup truck, where you could just drop the tailgate instead of this little thing. But on SUV, particularly one with the rear door that opens like a door instead of a hatch, some form of this could be very useful. This particularly kitted-out Honda Element had converted its sunroof into a portal to a pop-up tent mechanism that have been grafted onto the vehicle’s body, which is really cool, but I think this kind of ceiling storage could be employed in a regular adventure vehicle. You know, for all those times you’re driving along and suddenly you need a life preserver in a hurry. The paper plate dispenser in the kitchen area of this camper will probably be a familiar sight to anybody who worked in the kitchen at a summer camp, or maybe has been in a big private sailboat, but I had never seen one in an RV like this I have to say it’s a great idea for quick cleanup if you going to cook for a bunch of people in the bush. I love the quick-release spice rack, too. Everything is easy to get, yet locked in place at the same time. I mean, you’re going to want to move that teakettle before you get underway, but boat galley techniques like this go great in off-road camper cars. Stickers and patches are a big element of the overland scene. People love to show off where they’ve been and what they’ve bought, so, it makes sense. most off-road and adventure parts purveyors are wise to this so they put a lot of effort in making their stickers look sweet. But as fun as stickers are to apply, it can get tiresome looking at a collage of color every time you see your vehicle. The owner of this 4Runner in particular had a clever solution–hide the stickers in the doorjambs, so you get to see them once in a while. I dig it. I fear that the internet popularity of sloths may be starting to wane, but they are still beloved in my house. Here is one of the three sloths emblazoned on my wannabe overland rig in its second appearance on Jalopnik. Please enjoy it. Most people who pass me on the highway seem to. Overlanding, as a hobby and a look, has a lot of momentum right now and I think it’s going to stay popular for some time. The accessory market is big enough to turn any car into a bottomless money pit, and Instagram is standing ready to validate anybody making an attempt to get in on the hashtag vanlife right now. I’m sorry; I’m mostly kidding. 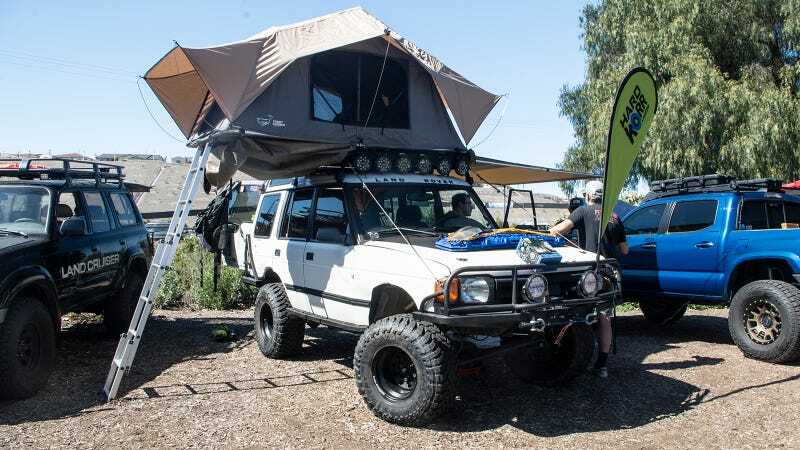 People running errands around Los Angeles with rooftop tents mounted to their SUVs deserve to be clowned on but car camping in a cool vehicle, and building a vehicle for that purpose, is really fun. My wife and I very much enjoy campsite optimization almost as much as actually hanging out in the wilderness. Some slices of car culture focus on improving a car’s performance, some are all about making a machine into art. Overlanding has both of those elements, but largely, it’s about dialing in your vehicle to your lifestyle. I’ll be interested to see if it stays popular forever or fades out of the mainstream like tuner cars did by the time the fourth Fast & Furious movie came out.